In the western novel “Covered Wagon”, the heroine Molly Wingate traveled the Oregon Trail in a wagon train of settlers. Encountering prairie fires and Indian arrows, the beautiful maiden eventually reached Oregon, where in the conventions of popular fiction, she found true love. In this illustration for the novel’s book jacket, W.H.D. 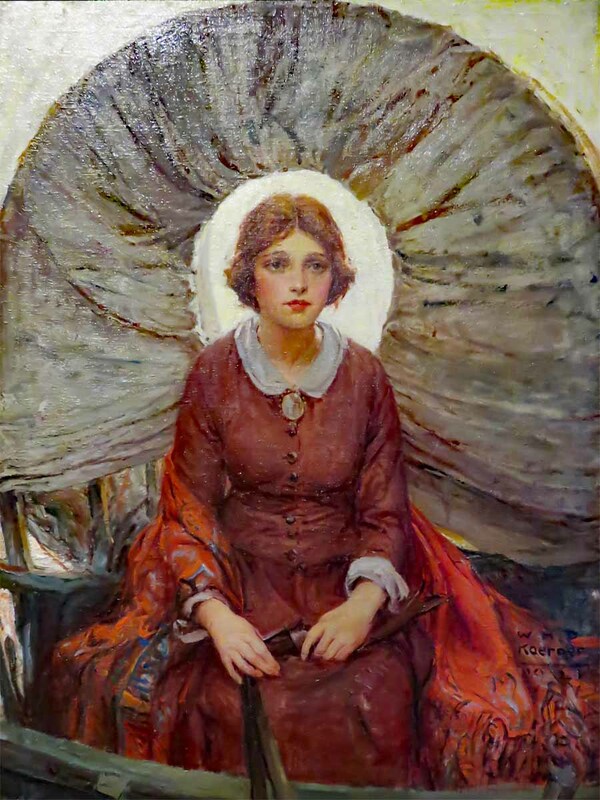 Koerner used the covered wagon to form a halo around the pioneer woman’s head to symbolized her purity. This romanticized view of womanhood is emblematic of dime westerns that idealize the feminine, often forsaking reality. On the way there, I witnessed an accident on the bike trail. It involved a woman cyclist, who was heading in my direction and two black men, both of whom were on electric scooters and heading in the opposite direction. I was following the woman and saw that as she passed a walker that was also heading in her direction, she nearly collided with the first scooter, before hitting the second. She and the second man fell, but fortunately on the grass. I stopped to ask if everyone was OK. She said she was and although neither of the men spoke, both seemed OK too. So, I headed on my way to the hospital. It all happened so fast that I still cannot say whose fault the accident was and I had the best of all possible eyewitness views. The two men were both hugging the centerline and the first seemed to momentarily cross it just before his near miss. She actually passed him on his opposite side, which seemed to cause her to lose control of her bicycle, before colliding with the second man and ending up sprawled in the grass on the opposite side of the path. About an hour later, I was heading home. As I approached the accident site, I had a premonition to look for something. Maybe in the rush of events that was the accident my subconscious noticed something flying out of someone’s bag. It was there in the grass, a Power Juice battery phone charger ($23.49 Amazon). There was no one else around, save for two city workers, both on rider mowers. Over the years, I have collected my fair share of swag and more rarely donated swag back to the park community, but in all of the previous instances, I never had an inkling to the original owner. I would have taken it anyway, even without the impending mowers. I promise to keep a lookout for the individuals involved in the accident and return the charger to its owner. I don’t really need it, because I already have a Power Monkey charger and I don’t need another one. If it was the woman’s that could be quite likely, since her route and mine coincided for several miles that day. If it was one of the men’s I would judge it less likely, primarily because they were riding rented scooters, but I’ll keep an eye out. This entry was posted in Art, Bicycling, Forest Park, Saint Louis by RegenAxe. Bookmark the permalink.